Des Moines didn't make the top 50 in 2016. Where does it rank in 2018? From building bike lanes to boosting bike share to installing bike-specific traffic signals and simply creating more fun places and ways to ride, here's our ranking of the 50 cities that are doing the most to make urban riding awesome. What makes for a great bike city in America? Is it the miles of protected bike lanes? The number of coffee shops? An abundance of stunning places to ride? Yes to all of that, but as we sifted through thousands of data points and chatted with bike advocates and transportation officials around the country, we determined that the best cities are the ones that don’t cater to one specific type of rider—be it the daily commuter or competitive roadie. The ones that top our list have built systems and a riding culture that benefits everyone—from the kid who rides to school to the retiree who takes a weekend trip to the grocery store. Our ranking system is out of 100 points divided into four categories, each weighted based on their importance. Safety tops the list and is ranked out of 40 points. Eight to 80 friendliness (how accessible the city is to riders of all ages) came next out of 30 points. Then energy—a measure of the political climate in regards to bikes—out of 20 points. Finally, culture—the shops, routes, and attributes that make each city a great place to ride—was ranked out of 10 points. For a more detailed look on how we ranked each city, go here. One takeaway we can’t stop thinking about is that there is no perfect American city for cycling. Our networks are still fragmented. Some cities have nothing besides paint-on-pavement lanes. Many socioeconomically disadvantaged communities lack any bike infrastructure at all. And we don’t have any one organization that collects comprehensive data on cycling injuries. America has a lot of work to do. But a few cities are leading the way, and seeing the work they're putting in makes us hopeful that other areas will soon follow suit. Check out how Des Moines ranks below. 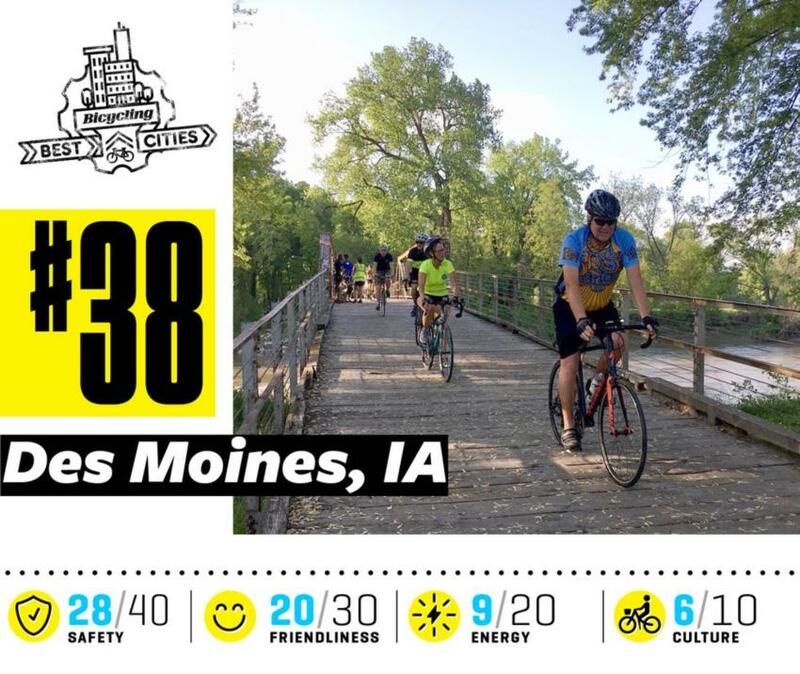 In 2017, Des Moines announced a $33 million dollar downtown overhaul aimed at slowing traffic and making facilities safer for cyclists and pedestrians, which energized activists and cycling residents in Iowa’s capital city. Still, the projects take time, and as of the publishing of these ranking, the city only has one mile of protected bike lanes established. More are coming though, as are more traffic-calming measures like speed tables, chicanes, and redistribution of car lane space for wider bike infrastructure. Also promising is that the city hired its first-ever bike and pedestrian transportation manager, thanks to a property tax increase which funded the position. These things are making Des Moines a safer place to commute by bike, and the city is certainly laying the groundwork to build a better network.